Availability: Free low-res PDF without spell lists. Paid print version (soft- and hardback) at LULU. Full PDF coming soon on RPGnow. EDIT: An Amazon softback version of the game is in the works, but it’s not available as of yet. Form factor: Very nice old school looking b/w book with cool fantasy art including a wealth of illos by the author himself. The book is well-written and a pleasure to read. Lots of old school feel! Community: Support for FH&W is mainly by the author himself on his web page. There’s a growing G+ group and a thread on the Dragonsfoot Forums. Product support: Just like the previous flavor B&T, FH&W is a one man show. After some initial re-writing of parts of the core book to fit the OGL better, there’s a few cool supplements in the pipeline: The Blasphemous Bestiary (new dark horror and Cthulhu-ish beasties), Swords & Cthulhu (Fantasy meets Cthulhu) and the Full Witchery Compendium (500 new spells + 20 new wizard classes). The author talks of them here. Tinkerability: This game is basically a toolbox of tinkering and has lots of optional rules, so yes it’s über-tinkerable. Compatibility: Excellent. 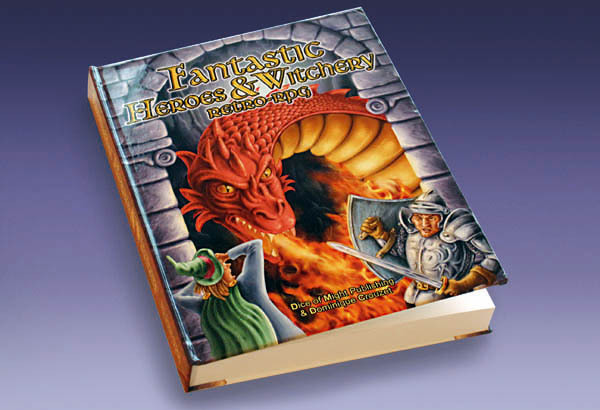 The game was designed to be used with any OSR rule set with minimal fuss. There’s even advice how to use it with 3e stuff. Flavor: My personal tastebuds says mainly 1e and 2e with elements of 3e and tons of NEW ideas. Saves: 1 (S&W style, but with the addition of using different attribute modifiers for different saves, so there’s a “Dexterity save” and a “Charisma save” and so on). Demi-human class and level restrictions: Yes, and ability score min/max also. Oookay…where to start…? First, I must say that I just love this game. There’s a definitive old school feel when reading the book, but with the addition of lots of new and alternative takes on the standard tropes. Characters: As seen in the statblock above, there’s a wealth of character classes to choose from (41 in total according to the author). They differ a lot from their usual counterparts in other games, but most of the old ones are there, albeit in a new guise and under a new name. The book also includes a simple background system to flesh out the character’s life before becoming an adventurer. The class abilities associated with the various classes also differ from earlier concepts. Another difference is a system of Talents in the appendix. These are new abilities that the PC can gain (or buy) over the course of the game. They are there to provide a degree of character customization, akin to the 3e feats, but much simpler. There’s 30 of these talents included as examples, and the author encourages the reader to invent new ones to fit his or her campaign style. Power level: FH&W tops out at level 13. At that level you are mega-mind powerful! Since this is a little more than half max level of most other games, the power curve is accelerated, so in FH&W you get all the cool abilities at a compressed rate. Thus, a 13th level FH&W character roughly compares to a 20th level character in other games. Personally I think this is a good thing. We never “played” a character up to more than about level 10 in our games, and with restraints on gaming time imposed by adult life , this fits my game aesthetic nowadays. Also, FH&W characters start out a little more powerful than their counterparts in other games. More on this later. Alignment: Gone in the traditional sense. There’s still Law and Chaos that represent otherworldly philosophical absolutes (as in Michael Moorcock’s books for example), but these absolutes do not govern what you can and cannot do. Instead, there’s an allegiance system where characters can pledge allegiance to a cause, nation, person, religion or deity. You can basically come up with whatever concept you wish here. I also like the discussion on how to handle the old alignments as personality descriptors. Again, they are for flavor, not meta-game tools to control the character’s actions. We always skipped the alignment thing, but there never was any mechanics to replace it until now. Magic: The Clerics are gone! The holy guys are now called Friars, and they cannot cast any spells. Instead, they can call upon divine help in dire situations. They also excel at healing, exorcism and turning of the undead. Basically, all spell casters are variants of Wizards in FH&W (you can of course be a religious wizard). If you use magic, you use arcane magic. Magic is also grouped into black, grey and white magic, usable by different wizard classes. Black magic is used by the Warlock, Grey by the Wizard and White by the Wise Man/Woman. And yes, using black magic (and especially spells labeled as evil) will lead to corruption and ultimately to the warlock’s doom. I like! And if you liked the 2e specialist wizards, they’re covered too. For casting mechanics, the spell system is old school Vancian, so no difference there. Most spells can be resisted by a saving throw. Additionally, there’s rules for dangerous magic and corruption, ritual magic, sacrificial magic and other stuff I haven’t seen before in an OSR game. Another nice touch is that the spell lists contain exactly 666 spells, mostly in the 1e/2e style. They are re-written though, so they will differ from the originals. Skills: There’s an optional and quite loose skill system included, with about 30 skills included in the appendix. The mechanic is like the 3e style with a DC number to beat. Classes with knowledge in the area of the skill to use, for example a Friar trying to use the skill Healing may add their skill level as a modifier to the roll. All characters can try all skills, but the classes are good at different things. Also, the skills are not included to restrict characters from doing things if they don’t have the skill. Rather, it’s a ordered system of how to solve the various tasks that a character might come up against. And if you don’t like skills, just ignore them. The game will work anyway. Combat: Basically the same as in other OSR games, but a little more codified and ordered. FH&W does not use to hit tables. Instead, there’s the 3e mechanic with a d20 roll + attack bonus vs. target AC. Actions in combat are codified in a simple manner with primary, secondary and free actions in order to determine what you can and cannot do in a single combat round. Again, inspired by 3e, but much simplified in FH&W. Initiative is personal, where you roll a d6 and add a number of segments depending on you action or weapon or spell (these segments are not the same thing as in 1e). All combatants then go in this order. Next round a new initiative is rolled, and new segments are computed according to what you choose to do.. There’s simple rules for crits and fumbles, with different effects depending on class. Nice idea, but I prefer my own tables for this, as they are much more lethal. If you want combat options, there’s a solid system of combat maneuvers included (charge, combat stunt, defense [parry, dodge, evade], dirty tricks, disarm, target specific area etc. ), allowing a more tactical combat approach rather than the usual ping-pong game of hit point attrition. A bit crunchier than most OSR systems, but clear and logical methinks. There’s also a new concept for Hit Points in this book. At first level characters get two kinds of hit points: racial hit points (aka Wound Points, which you only get at 1st level) and class hit points (aka Vitality Points, gained at each level-up). The class hit points works as before – you’re at full power until they are all lost. When class hp are at zero you start to take damage to racial hp, which represent serious wound damage. Each racial (or Wound) hp lost imposes a -1 penalty to all activities and furthermore a -5 feet penalty to movement. When at zero racial hp you’re still conscious, but very weak, and at -1 you’re dying. If not tended to hp will dwindle away until dead at -10 hp. (I’m not too keen about this negative hp thing, so I might write up some house rules in that department). This also means that a 1st level FH&W character will be more resilient to damage compared to other iterations of the game. To me this is a good thing, as the GM now can start the adventure with tougher adversaries. General: All classes have certain weapons that they are proficient with. Using weapons other than these is not prohibited, but will generally impose a -2 or -4 modifier on the to hit roll. Also, wizards can wear armor, but there’s a very good chance that the spell won’t work. The heavier the armor, the greater the risk of spell failure. There’s also a simple psionics system, rule suggestions for sanity and insanity, rules for dangerous magic and corruption and a very good chapters on religion, magic and the multiverse, discussing various ways of handling these things in your own game world. This is also a first for me, as I haven’t seen these discussions before. Game support: As mentioned before, there’s a lone guy working with this project, so probably the supplements will take some time. There’s also a bunch of free PDF:s at the game’s web page: (i) 1-page character sheet, (ii) 3-page character sheet, (iii) form-fillable character sheet, (iv) supplement with traditional cleric, paladin, bard and monk classes and (v) supplement with alternative rules for multi-classing. But, as this game is intended as much as a modification to existing games as a free-standing game, you can use stuff for other games in the meantime. And hopefully, the fanbase will produce lots of super-cool additions to the game! It must also be said that some parts are missing from this book, namely Monsters and Treasure, including Magic items. In that respect, FH&W is not a complete game. That said, it’s easy to use those sections from your favourite game of choice. Regarding monsters, there’s a few pages discussing how to use monsters from different sources (old school and 3e) in a consistent manner in FH&W. There’s also a section with Morale rules and Monster reactions. Personally, I bought the Adventures Dark & Deep Bestiary to use with FH&W, but you can use whatever monster book you like. All in all I would say that FH&W is very much like Ye Olde Game, but also very different. I can see inspiration from not only 3e, but also from Warhammer Fantasy Role Play and d100 games like RuneQuest. Where the old rules were vague or missing, there’s now suggestions on how to handle those situations which in my opinion is a good thing. I also like that some of the old D&D-isms like “wizards can’t use armor” or “this class can’t use that weapon” are gone. Virtually all the old D&D-isms I’ve been house-ruling in different ways have been addressed here. If you’re interested, here’s the author’s comments on the game. From an editorial point of view this book is a beauty. The cover differs from most OSR game’s more somber style. The cover and spine is full of colour, making the book stand out in the game shelf. Print quality is LULU standard, and my hardcover seem to hold up well despite hours of reading and leafing through. (The final field test will be the Gaming Table and carrying from place to place of course…). The new 2.0 edition is also available in a slightly cheaper soft bound edition, but the author actually disencourages purchasing, as it is more prone to damage because the thin covers can’t handle the 400+ pages of the book. I like the writing style. It is easy to understand and the text flows well. Included is also an excellent index, which often is missing in many “one man project” POD books. The downside is that the book is organized in a not-so-obvious manner. For example, the classes are spread out through the book. There’s a chapter of classes, where most standard classes are. Then, there’s specialist wizards in the magic chapter and yet some priest variant in the religion chapter. Finally, there’s some “extra” classes at the end of the book. After some reading and with the help of the excellent index, you’ll find your way around the book fine, but at first I was quite lost. The book has gone through a quick flow of editions. When the book was released in the end of 2013, it was in it’s 1.2 or 1.3 version. It was only for sale for a month or two, before the author took it down for a major overhaul due to OGL license issues. Now the book is in it’s 2.0 version with typos corrected and about 70 spells re-written so as to not violate the OGL. The author has promised a free PDF with the changes so that owners of the old book (like me) can update those changes. Hopefully, Mr Crouzet can now direct his attention to those cool supplements mentioned on the game’s home page. I especially recommend this book for GMs looking for a rule set that support more gritty or Dark Fantasy-ish settings, or GMs that would like some inspiration or a toolbox of rules suggestions for other OSR games. Finally: I love Swords & Wizardry for its simplicity, Labyrinth Lord for its old school “just-as-we-used-to-play” feel, Blood & Treasure for its completeness and for acting as a bridge between 3e and older versions of the game. But FH&W actually brings something NEW to the table, without losing its retro-feeling. And that’s a good thing, at least in my book. Footnote: When I write OSR-games I include all old school games up to 2e as well as the new clones/simulacra. Some of you hate the OSR epithet, but I think it’s a handy way of labelling that whole group of games. Thanks for the review! I’ve downloaded the free .pdf. and it looks neat. I remember when OSR was called D&D Heartbreakers. How times have changed. This curious about this, though. Hi! I notice you mention “B&T” and that this post is Part 4 of a series. Due to my poor blog navigation skills, I am unable to deduce: What is B&T, and where are the other 3 parts of this post. Links and/or navigation aids would be great, as well as fewer acronyms.